"Lange Nacht der Kultur 2018" in Kaiserslautern. Download the festival brochure here [PDF 14.3MB]. There will be a screening of rare film footage (open source) and artist Hanna Zimmermann will present Analog light projection / Overhead projector art. There will be a screening of rare film footage (open source) and Matthias Strobls team will present their Analog projection with the lightmotiv oil projection system(tnl). There will be a screening of rare film footage (open source) and artist Deborah S. Phillips will present "3 Colours of Light - Slide collages". There will be a screening of rare film footage (open source) and media artist Karen Thastum aka Tura ya Moya will present a very special light show. "Festival 25 Jahre oh ton"
Sorry, no gigs at the moment. We have been working on our new album for over a year now and we have about 90 percent finished. Get prepared for the release! We will be gigging again once the record comes out. Want to know how our studio looks like? All three musicians are admired for creating a timeless style based on free improvisation. Halleluhwah! in Berlin /w. atelierTheremin live! hieß die Band, „Berlins Neo-Krautrock-Pioniere“ boten Maschinenraummusik für alle Beteiligten. So ein Vernissagen-Abend ist selbst in Berlin selten." this time atelierTheremin is honoured for being asked to perform live on this very special occasion! In the year of the 40th anniversary of CAN’s milestone album TAGO MAGO, Halleluhwah! is an hommage in memory of the band’s pioneering role in composition, sound, playing technique, and group dynamics. ... featuring CAN, Irmin Schmidt, Jaki Liebezeit, atelierTheremin and others, on CD. Boxhagener Str. 99, 10245 Berlin. Whenever members of the still-highly-prolific German Krautrock legend FAUST send out an invite, it’s about structures and musical boundaries to be blown up - and about expanding music into the domain of the gesamtkunstwerk (total work of art). On may 25, Zappi W. Diermaier, founding member of FAUST, will present sound recordings by congenial artists, mainly chosing material that is not released yet. Additionally, brief live-sets will be performed by FAUST themselves and by atelierTheremin, supported by organist Michi Wehmeyer of Embryo. Designing the visual space on this event are Sigrun Drapatz (light installation) and Vadim Levin (VJ). Goblin, Turzi, Schneider TM, Von Spar, Night Terrors, Zirkon, Warm Digits. 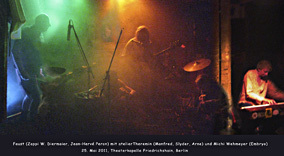 Following up on their successful series of events at the Babylon-Mitte movie theater in Berlin in 2007, atelierTheremin will resume the concept of combining live music with movies which are screened without sound. Berlins well known electronic Neo-Krautrockers will add sound to some of the most prized gems of the 60s underground film genre. This time the upcoming event takes place on the occasion of the UNERHÖRT! festival in cooperation with the BERLIN MUSIC WEEK 2010. Bernd Witthueser, once a member of the Kraut-folk duo Witthueser & Westrupp, will give a special live performance at the berlin Zodiac. The atmospheric music background will be performed live once again by Zodiac hosts atelierTheremin - mind-shattering psychedelic neo-krautrock sounds played on strictly analog music eqipment. Location: WAU, legendary former/ end-60s "ZODIAC Free Arts Lab" below HAU2 at Hallesches Ufer 32/ Grossbeerenstrasse, 10963 Berlin-Kreuzberg, near U-Moeckernbruecke. Admission free! On Wednesday, April 21, atelierTheremin will perform with another famous special guest in Berlin: with Michi Wehmeyer, a longtime member of the Munich-based Krautrock band EMBRYO. The music commune EMBRYO is one of the most important bands of the genre. Entering the stage together with atelierTheremin Michi will play the quarter tone electronic organ (Viertelton-Orgel). Before the concert starts the movie "EMBRYOs Reise" (EMBRYOs Trip) will be shown (8.00 pm). Hallesches Ufer 32, 10963 Berlin (near Großbeerenstraße, Kreuzberg). Admission free! Next gig at the ZODIAC Club: February 11, 2010. Special guest: Wolfgang Seidel (drums). Wolfgang Seidel (aka Wolf Sequenza) was the first drummer of the legendary Berlin band TON STEINE SCHERBEN. With his friend, the Intermedia-Artist Conrad Schnitzler, who was the initiator of the "Zodiak Free Arts Lab" (ZODIAC), he has been a founding member of bands such as KLUSTER, ERUPTION and KILOWATT. For many years he is meeting friends to "make some music (or noise)" under the name Populaere Mechanik. We are going to establish ourselves as the regular house band for the resurrected ZODIAC Club! We will be pleased to welcome another special guest that night. atelierTheremin will perform at the former ZODIAC Free Arts Lab again! Come and visit us on September 17, 2009. The evening begins at 8.00 pm and there will be an additional event: a reading of utopian literature with special guest, actress Miriam Eberhard. On June 18, 2009, atelierTheremin, in co-operation with Krautopia, will be staging a spectacular event at a renowned location in Berlin: the former ZODIAC Free Arts Lab. This was the birthplace of the Berlin underground music and political scene in the late 1960s, where artists such as Klaus Schulze, Agitation Free, Manuel Göttsching and Ash Ra Tempel, Tangerine Dream, Cluster as well as others all started their international careers. At that time, the "Zodiac" (also known as "Zodiak") was a hip location where music, art and politics merged and where the so-called "Berlin School" of electronic KRAUTROCK was established. KRAUTOPIA would like to invite you to the Record Release Party for the release of the CD "Morgen im Garten des Neokrautrock" by atelierTheremin. The evening begins at 8.00 pm and the group will be performing live at 10.00 pm. on the same day we will be celebrating the 66th birthday of Germany’s legendary promoter of KRAUTROCK, the genius and still missing cosmic courier Rolf-Ulrich Kaiser. Is he going to materialise and speak to us once more? beneath the Hebbeltheater am Ufer (HAU 2), Hallesches Ufer 32, 10963 Berlin (near Großbeerenstraße, Kreuzberg), U-Möckernstraße. "Morgen im Garten des Neokrautrock"
our concert at "Stahl und Stein / Klangräume"
Konzertsaal, Neues Rathaus, Berliner Platz, 35390 Gießen. Starts: 8pm / Admission free ! Beginn: 20.00 / Eintritt frei ! Analog light projection: Hanna Zimmermann. atelierTheremin at the *Haus der Kulturen der Welt* on November 28. The House of World Cultures (as it is called in English) is the former Kongresshalle (convention hall) in Berlin. Gernot Bölian quits the band. Gernot has decided to leave atelierTheremin due to the fact that he had very little time to practice and perform, and finally because of increasing musical disagreements. Good bye and good luck! im "Ä" in Berlin-Neukölln, Weserstr. 40 / Ecke Fuldastraße. atelierTheremin live at the BABYLON:MITTE movie theater! The tickets had been sold out early and the room was crowded ! Friday, APRIL 6 at 10pm. * In the past year, since the second atelierTheremin CD came out, a lot has happened. The positive reviews of the CD in the press plus the fact that the atelierTheremin project is becoming increasingly well known have resulted in a growing number of musicians showing interest and wanting to collaborate. So, since the beginning of the year the band has new members. We now have musicians with many years of experience: Arne Paul Neumann who plays electric guitarlele and hawaiian steel guitar, and the singer Slyder, well known in the Berlin scene, who is impressive not just for his vocal experiments but also for his charisma. Bandleader Manfred Miersch wishes to thank JJ Jones and Megan Gay, who have had to leave. JJ has been a member of Der Plan for some time now, a band founded by Moritz Reichelt in 1979, and is also working on various solo projects. Now there is just not enough time for exciting unconventional projects like atelierTheremin, so we have ended our collaboration amicably. In the last two years Megan appeared as an actress in various art film productions. Faced with the difficult choice of continuing an increasingly successful film career, or working on becoming a professional musician, Megan has chosen film, perhaps material considerations also played a role. All the best to you both, Megan and John! The departure of the two friends and the input of the new band members has led to the break-up of established structures, including musical ones. In the meantime we have succeeded in extending, perfecting, and radicalising the well-tried and distinctive musical concept of the band. atelierTheremin 2006/2007 better than ever! Executive Producers: Kerstin Walz, Joaquin Aparicio-Staubach, Georg Ilse. 55th Berlin International Film Festival (55. Internationale Filmfestspiele Berlin).